It's hard to imagine anything still alive that was born in 1505. That was the year that Martin Luther became a monk and King Henry VIII called off his engagement with Catherine of Aragon... in short, a bloody long time ago. But that's exactly what scientists believe they have found in the form of one massive Greenland shark swimming in the icy waters of the Arctic Ocean. The shark is estimated to be up to 512 years old, which would make it the oldest living vertebrate in the world and even older than Shakespeare. And you thought turning 30 made you ancient. Greenland sharks have been known to live for hundreds of years and spend most of their lives swimming around looking for a mate. That's a long time to wait. They also grow at a rate of one centimetre a year, enabling scientists to determine their age by measuring their size. 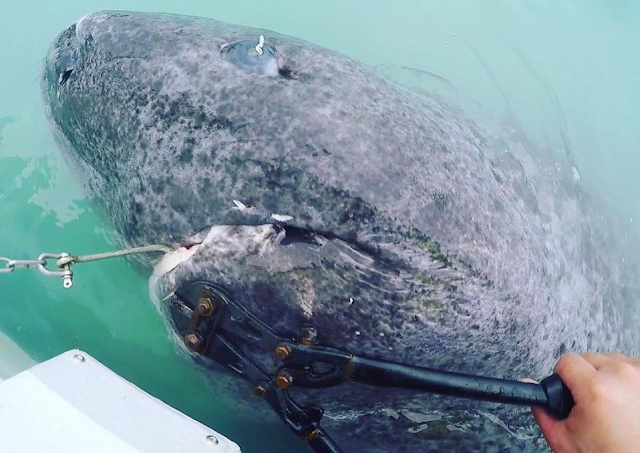 This particular shark, one of 28 Greenland sharks to be analysed by the scientists, was measured at 18 feet in length and weighed over a tonne, meaning it could be anywhere between 272 and 512 years old. The shark's potential age was revealed in a study in the Science journal, according to the Sun. If scientists have got the shark's age right, it would have been alive during major historical events like the founding of the US, the Industrial Revolution and both World Wars. Crikey. Greenland sharks mostly eat fish but have never actually been observed hunting. Some have even been found to have reindeer and even horse remains in their stomachs. The animal is a delicacy in Norway but its flesh is poisonous if not treated properly. 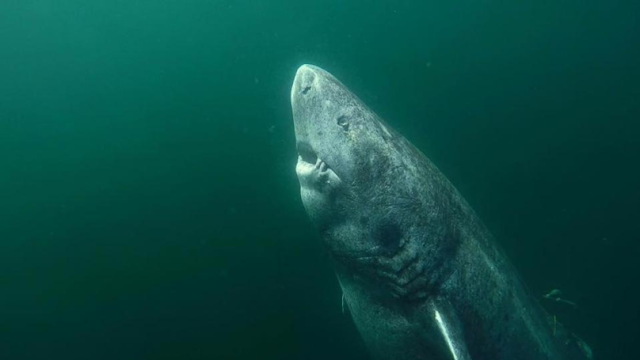 Because of their longevity, academics in Norway believe that the bones and tissues of Greenland sharks may give us insight into the impact of climate change and pollution over a long period of history. Researchers at the Arctic University of Norway are currently mapping the animal's DNA, looking at its genes to learn more about what determines life expectancy in different species, including humans. As many of the sharks pre-date the Industrial Revolution and large-scale commercial fishing, the sharks have even been called 'living time capsules' that could help shed light on how human behaviour impacts the oceans. "The longest living vertebrate species on the planet has formed several populations in the Atlantic Ocean," said Professor Kim Praebel at a symposium organised by the Fisheries Society of the British Isles. "This is important to know, so we can develop appropriate conservation actions for this important species." I wonder what happened to this one. Or what they do if one is caught by fisher-people. I think it would be smart to attach one of those tracking things on it to learn their travels; but people just-fishing don't carry that high tech stuff with them. This needs scientists. In the end I hope ALL are allowed their freedom. My thought as well. I'd just as soon we leave them be. Was it released to continue it's life? According to the article they measure and weigh it, then I imagine release it so they can track these measurements over the years. Fantastic, but who can be sure to tell ? If there is one, there must be more of them sharks. It´s an Ocean secret and a DNA factor I guess many would like to study for a long life on land. I care and millions of other people care. For all life is connected. Only stupid and ignorant people don't care. They always have to throw in something about studying climate change, don't they? Because the climate is changing rapidly. Uh....yeah because unlike you who sees this as a liberal political issue which you hate to the depth of your being, intelligent people know that climate change is a science-backed undeniable truth that needs to be addressed...not something to fuel your blindly ignorant conservative viewpoint. I'll bet they took it and disected the poor thig to see how long it was able to stay alive, staying away from human kind. Samples were taken and measurements and blood.. a tiny tissue sample and it was released !!!!! To continue its life. If you notice, they are cutting the barb off the hook to slide it out easily so I am sure this guy was tagged and released with no harm. Watch some dickhead catch it and kill it. In the name of sport. Too hard and pray they dOn't :) ))) The crearures are majestiC !!! ! Stupid people saying "they probably killed it to do tests" Oceanographers...Scientists are wanting to save sharks not kill them, they are trying to protect the sharks at all costs from their decreasing numbers over the years because people kill them so heartlessly. All they need is samples to get most of the answers they are looking for. And that'll be great to get some answers about climate change. Something needs to make us change now! very unscientific, science does not use, could be, maybe, or if. Also, how was it determined they grow 1 cm a year, That is highly unlikely, as no know similar species that has been studied, grows at a consistent rate over hundreds of years. What this article does say is, these Greenland sharks, appear to be really old. how old, is not understood. and for good reason, no one measured this fella 512 years ago, when it hatched/born. Or even a hundred years ago. I do agree, science needs to make this stuff interesting, so folks will care, But to fabricate, come on, why not 513???? This type of article, pretty much allows folks to dismiss science. Q: how was it determined they grow 1 cm a year? A: Teams of biologists capture, tag, and recapture the fish many years later. Doing this to dozens of hundreds of sharks over many years gives us an average into how large the sharks grow per year. S: No know similar species that has been studied, grows at a consistent rate over hundreds of years. R: This is misleading. No known vertebrate lives hundreds of years and we do not have records dating hundreds of years. That being said, each animal has its own growth curve, some more linear than others. The greenland shark just might have a near perfect linear curve. A: baby and newborn sharks have been studied. We know their size when they're born (40–100 cm). The length of over 50,000 greenland sharks have been recorded over the century. That coupled with measurements and tracking of young sharks, and growth of older sharks, allows scientists to build a mathematical growth curve of the species to estimate it's age based on it's size. Q: why 512, why not 513? A: this is where the article is actually misleading. The tissue samples taken from the 28 oldest (largest) sharks gave an age range of 272 to 512. There is of course room for error in these samples. Maybe the oldest shark was 300, 400, 450, 500. All we know is that none of them were older than 512 years, and the article sensationalized that. Bigelow, H. B. & Schroeder, W. C. (1948) Sharks. In Fishes of the Western North Atlantic, Part 1 (Tee‐Van, J., Breder, C. M., Hildebrand, S. F., Parr, A. E. & Schroeder, W. C., eds), pp. 59–546 Yale, CT: Yale University, Sears Foundation for Marine Research. Hansen, P. M. (1963). 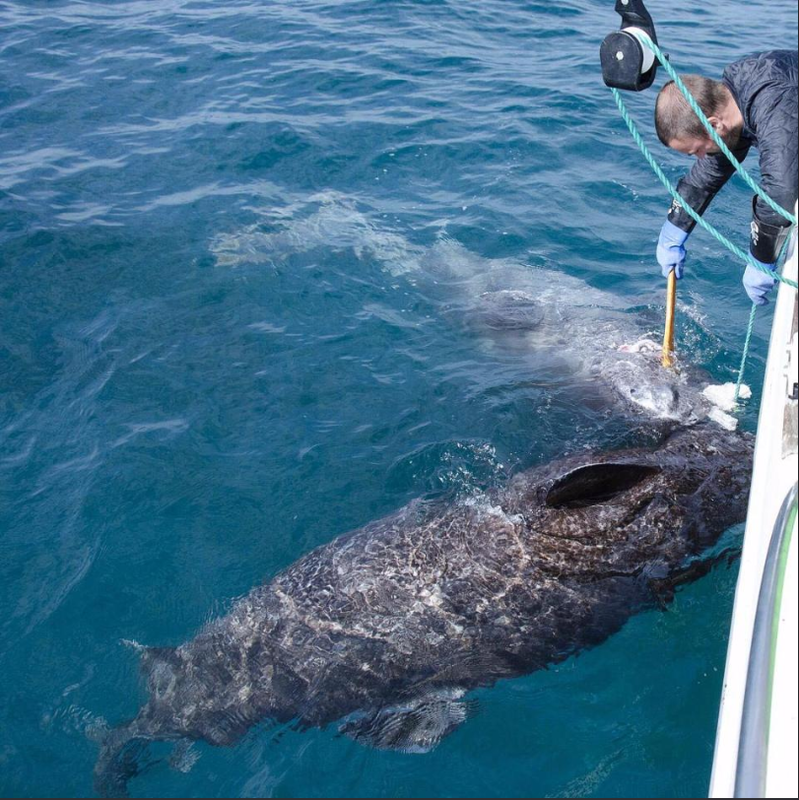 Tagging experiments with the Greenland shark (Somniosus microcephalus (Bloch and Schneider)) in Subarea 1. International Commission Northwest Atlantic Fisheries Special Publication 4, 172–175. Johansen, J. B. (2002). Shark meat shouldn't go to the dogs. Suluk 1, 50–51. Kondyurin, V. V. & Myagkov, N. A. (1983). Catches of newborn Greenland shark, Somniosus microcephalus (Bloch and Schneider) (Dalatiidae). Journal of Ichthyology 23, 140–141. Yano, K., Stevens, J. D. & Compagno, L. J. V. (2004). A review of the systematics of the sleeper shark genus Somniosus with redescriptions of Somniosus (Somniosus) antarcticus and Somniosus (Rhinoscymnus) longus (Squaliformes, Somniosidae). Ichthyological Research 51, 360–373. Nowadays, the plastic pollution is one of the biggest environmental burdens. 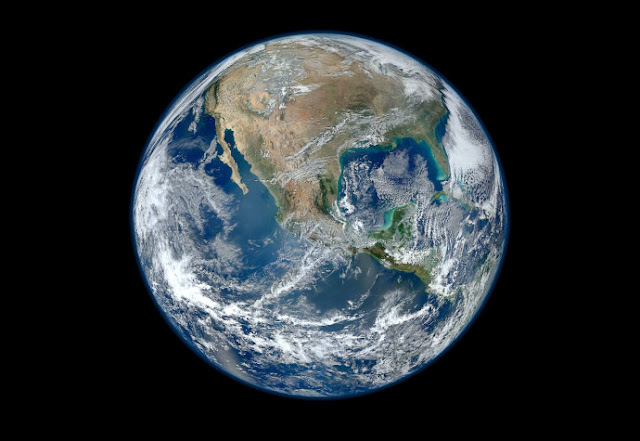 Statistics say that annually, we throw away enough plastic to circle the globe 4 times. Also, it has been shown that 50% of the plastic is thrown after the first use. Newest studies suggest that the consumption of water and food in plastic bottles and packages is extremely detrimental to health, as plastic contains various harmful chemicals that leech in the water or food, and are thus entered in the human body. One of the most harmful compounds in plastic is bisphenol A or BPA. The exposure to this toxin during pregnancy has been found to lead to low birth weight in newborn children. This chemical has been initially used in the process of manufacturing of everyday plastics like helmets, food containers, goggles, paper receipts, and the coating of metal tins and cans for food. Due to all this, apparently, all people contain it at some level in the blood.